Junior guard Josh Mayo leads the nation in three-point field goal percentage and can run the offense as well. Josh Mayo and UIC are kings of the three-point universe in college basketball. For the second straight week, Mayo tops the national charts at 55.4 percent (56-for-101). The Flames, as a team, moved to the top of the heap. They are now blistering the nest at 43.8 percent from downtown (148-for-338). Mayo improved his percentage by shooting 8-for-12 in the Flames’ games against Wright State and Detroit last week. Mayo was hovering around 60 percent from three-point land in December before starting point guard Spencer Stewart broke his left hand. Mayo then struggled for a few games, but has picked up his touch again as both he and freshman Robert Kreps have shared point-guard duties. 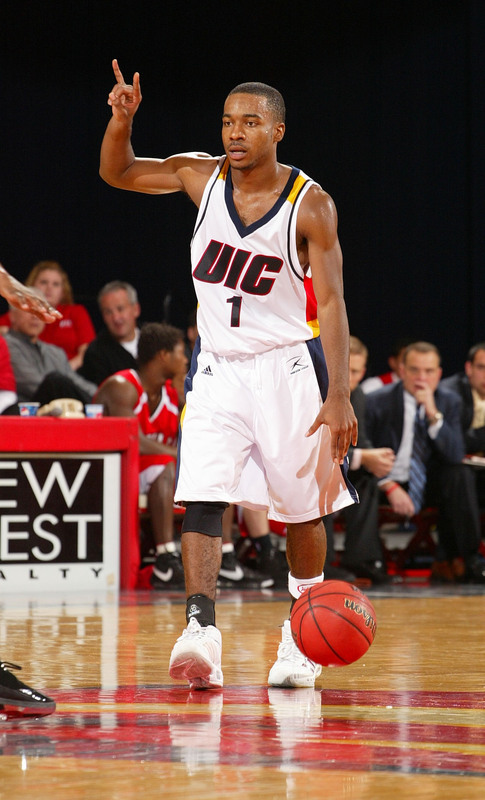 UIC has made some adjustments as has Mayo and the junior guard is back to his old self. “I don’t worry about Josh missing shots, because he will start making them (eventually),” UIC coach Jimmy Collins said. Mayo has a smooth release and can stroke it from 25-feet out on a consistent basis. When he is on like he was against Wright State last Thursday when he shot 6-for-7 from downtown, Mayo’s shot is pretty from release until it swishes through the net. Despite Mayo’s unbelievable shooting skills, Collins likes the fact that his star is a team player. Mayo’s play has impressed his teammates. Mayo, a Merrillville, Ind. native, leads UIC at 17.8 points per game and has topped 20 points on six occasions. He has hit a three-pointer in every game this season except one. The Flames also boast several others than can hit the three with confidence including Kreps (44.1 percent), senior guard Karl White Jr. (44.0 percent) and Robert Bush (40.4 percent). Bush hit five threes in UIC’s win over Detroit last Saturday. Now the Flames will face a stiff test Thursday night at Valparaiso, another team that can shoot the three-ball. The Crusaders convert 40.2 percent of their three-point attempts and rank 23rd nationally. They also have players that can cause mismatch problems in 6-foot-8 Samuel Haanpaa (43.5 percent) and 6-foot-7 Shawn Huff (45.8 percent). Guards Brandon McPherson (45.0 percent) and Jarryd Loyd (45.2 percent) are also threats. So, the Flames can not afford extended defensive lapses on the perimeter. UIC (10-8 overall, 4-3 Horizon) and Valparaiso (13-6, 4-3) stand in a fourth-place tie in the Horizon League with the winner still boasting a decent shot at second place and the all-important double-bye to the semifinals of the conference tournament. If a team focuses on the outside, then 6-foot-9 Urule Igbavboa can cause some pain on the inside. Igbavboa averages 9.9 points and 6.4 rebounds per game. Three Crusaders average in double figures, including Huff (11.9 points per game) Loyd (11.6) and Haanpaa (10.7). Loyd, a Niles West graduate, is Valpo’s sixth man, but he suffered a dislocated pinkie on his right (shooting) hand against first-place Cleveland State last Saturday, so his effectiveness could be limited. Junior guard Jake Diebler and freshman forward Bryan Bouchie are solid role players. Diebler is a gritty, high-energy player that gets that prides himself on defense, while Bouchie gives Valpo another solid presence in the post. The Crusaders have been impressive in their debut season in the Horizon League, losing only to Vanderbilt, Wisconsin and North Carolina in conference play. Their conference losses have come against the top three teams in the Horizon: Cleveland State, Butler and Milwaukee. SICK BAY: Stewart’s left hand is supposed to re-evaluated this week. With luck, the sophomore point guard will be able to return to the lineup some time in the near future. … Sophomore forward Jovan Ignjatovic missed both games last week with the flu and is questionable for Thursday’s game. The Flames lead the all-time series 26-8, but they haven’t matched up with Valpo since Dec. 13, 1997. UIC won that game 72-51 and both teams eventually made the NCAA tournament.